Laos has remained a mystery to most Westerners even after the names of its neighboring countries—Vietnam, Cambodia and Thailand—have become commonplace. Music of Laos: The Buddhist Tradition is the result of a collaboration between the University of Applied Sciences in Emden, Germany, and the Ministry of Information and Culture of Laos. If Laos is still a mystery to the West, its music is even more obscure. As producer Gisa Jähnichen points out, little research has been done on musical practises in Laos. She determined that only 22 albums were ever issued of Lao music—some on cassette only, many of dubious quality, and most generally unavailable. Apart from the khen, most types of Lao music were woefully under-recorded. Buddhism has greatly affected both the ‘classical’ ceremonial ensembles and the rural or ‘folk’ singing and playing of the farmers and villages. Music happens at all the major events in the Lao calendar, especially at the beginning of the New Year and during full moons, and at weddings, funerals, and other special occasions. The songs performed at these events are not haphazard; there is a strong tradition of prayer and thanksgiving that can be heard at a village wedding as clearly as at a grand temple festival. It is this tradition that is represented on this recording. Recording the ceremonial ensemble of Champasak in Champasak province (which is the source of the first four tracks on this collection) offered an opportunity to record a fabulous set of instruments that had been made in 1750 and are still in use. But in Xieng Khuang, Jähnichen’s crew spent three days without water and electricity, and automotive repair seems to have been as much a part of the production team’s job as the actual recording. The infrastructure of Laos is not up to modern standards, and while the area of Luang Prabang was served by a new road, unregulated irrigation by local farmers made it difficult to get very far without having to alter course several times. Jähnichen also found that the religious/ritual music of the province was far less accessible than the classical court and entertainment styles. 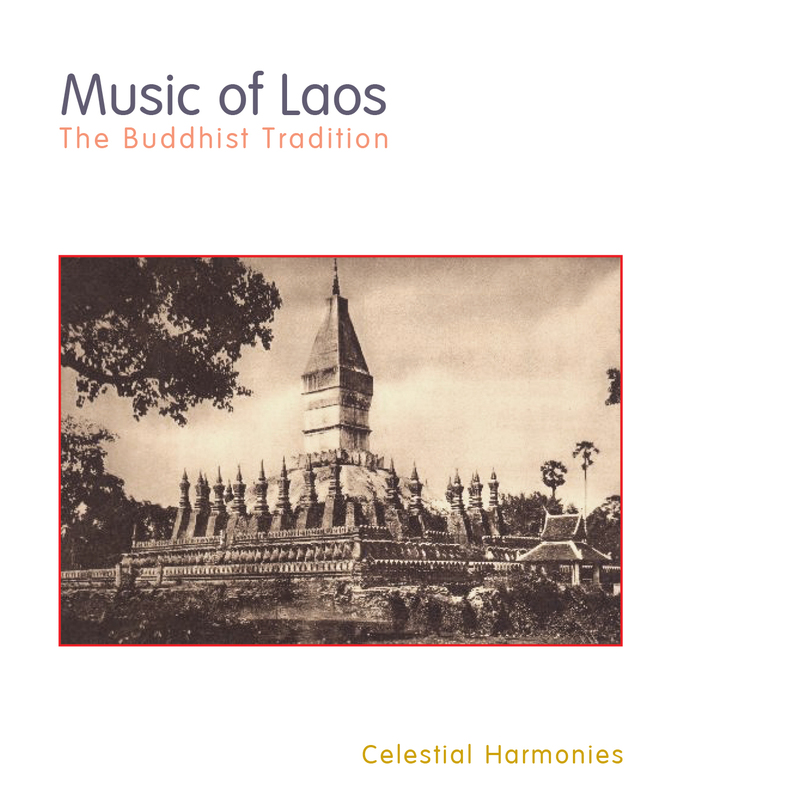 The last five tracks on this collection come from Luang Prabang, featuring the Pi Mai ensemble, and while they clearly feature a ‘classical’ ensemble and some fairly obvious ‘popular’ tunes, they nevertheless show the pervasive influence of Buddhism, as they were all part of the Buddhist New Year celebration held in April. Through it all, Jähnichen recorded as much as she could. “We made a cross-section of actual music practices; it was not our aim to record the whole musical history of a particular ethnic group.” With her crew she documented 24 different ethnic groups in Laos between June 1999 and May 2001. They made nearly 1000 audio recordings totaling almost 80 hours of material. Music of Laos: The Buddhist Tradition is obviously just a sample of the resulting archives. This volume, as the title indicates, serves merely to hint at the enormous presence and impact of Buddhist thought in various forms of Lao music. 2 Sep naichangva khamenpatkho 4'59"
5 Ti kongleng naybunokphansa 0'55"
7 Lattana thet/Thet sana naybunvisakhabusa 4'00"
9 Ti kongleng naybunokphansa 1'53"
10 Phithi takbat naybunpha Thatluang Vientiane 3'04"
11 Ti kongleng (Leu Ban Patchek) 1'05"
12 Phithi takbat naybunkhauphansa 2'35"
13 Suatmon vaipha nayvanvisakhabusa 2'32"
14 Ti kongleng (Leu Ban Hatkho) 3'11"
15 An nangseu thamkhao 1'06"
16 An nangseu ngom 2'02"
17 Khap salang khu (xay-nying) 2'39"
18 Khap samsao khu/khap thum Luang Prabang khu (nying-xay) 11'28"
19 An nangseu longkhongkhoeymai 3'18"